Of course it still needs work, but I thought I’d share my progress with you as I work on this. I was hoping to have the eBook done by Christmas, but that was before I realized it’s almost impossible for me to not add detail. See, I was going for a style like the size comparison critters in this chart. What would you prefer? The simpler, cuter, faster to draw style, or the more detailed sketchiness I’m currently going with. It’ll take a bit longer, but I’ll keep you posted regularly on my progress! Flipper is part of a unique-snowflake group of animals called Ichthyosaurs (think Ick!-theosaurs). Way back when his great-great-great-great-super-great grandaddy (some lizardy thing at the time) started spending a lot of time in water. So much time, that he got really good at it, so now Flipper is basically what a dolphin or fish would look like if reptiles started an aquatic lifestyle. At least that’s the theory. No one’s found this hypothetical, reptilian, super-great grandaddy so far, and there’s a lot of discussion when it comes to figuring out Flipper’s closest relatives. Flipper here doesn’t think too much about all that though. He’s just happy with the bucketful of squid Pete brings him. With the Holiday Season upon us, I’ve decided that I’ll be slowing down the weekly posts. After 6 months of developing the habit, it’s going to be tough to come up on Monday and not have a post up…but that doesn’t mean I’ll be slacking! The time I would normally dedicate to a new post will be used to finish my mini-comic book. Once that is up on Amazon I’ll then be ready to set up the sign-up forms for Postcards from the Shop, and really get to work on the picture book itself. It’s time to stop procrastinating in the research and build-up phase, and actually get it done! I still plan on continuing with our Critter of the Week every Wednesday, but there won’t be any new pages for a while. At least not until I get the eBook up on Amazon. You’ll see an Art & Science post every now and then too, since there are still things I don’t know much about, and definitely need more research on. The oft-proclaimed smallest dinosaur in the world is!…not as small as you might think. 1. First things first, how do you say that?! 2. Ok, so what exactly is an “icktheosaur”? Long story short, they are reptiles specially adapted to live in water. They were born, grew up, had babies, and died in water. Basically, reptilian “fish”. Or reptilian “dolphins”. They appeared during the Triassic period, around the same time the first dinosaurs started running around. They shared a “golden age” with dinosaurs in the Jurassic period, but most died out by the time the Cretaceous period arrived. A few species held on a while longer, but they missed out on the big asteroid that hit Earth. 3. Why do they look so much like fish/dolphin/shark…things? If it isn’t broken, why fix it? The fish/dolphin/shark body shape works so well for a lifestyle in water, multiple animals have adopted it. A streamlined, torpedo body with stabilizing fins is perfect for slicing through water efficiently, so very little effort is needed to move around. It’s a perfect example of what is called convergent evolution, which is when several completely unrelated animals (i.e. fish, reptile, mammal) develop similar body plans or lifestyles. 4. Wait a sec…How do we know they looked like that? That’s an easy one. Some Ichthyosaur fossils have preserved the soft tissue of the animal, so we can see the streamlined outline, as well as a shark-like tail and fins. Many fossils also preserve things that give us clues on behavior, like a mother giving birth to live young. The fossil captures the newborn Ichthyosaur mid-birth! 5. No way…how do you know it wasn’t eating the smaller one? Paleontologists can tell that the smaller Ichthyosaur was not there for some random reason because of where it is. The little one was halfway inside the larger one (instead of just layered under it), but clearly in the right place for a baby, and not lunch. Of course an Ichthyosaur will eat whatever it can get, including fish, but the squidy things where just soo common. Sheer numbers means they get eaten more often. Want to find out more? Just take a look at this awesome post by Duane Nash at his blog, Antediluvian Salad. So there you go, “Ick-theosaurs” in a nutshell. 😀 Reptiles that dove into the water, took the life and body shape of a shark, and lived alongside the dinosaurs eating calamari. I’ve been working on actually finishing the homepage image for a bit now, and I thought I would share my progress so far. 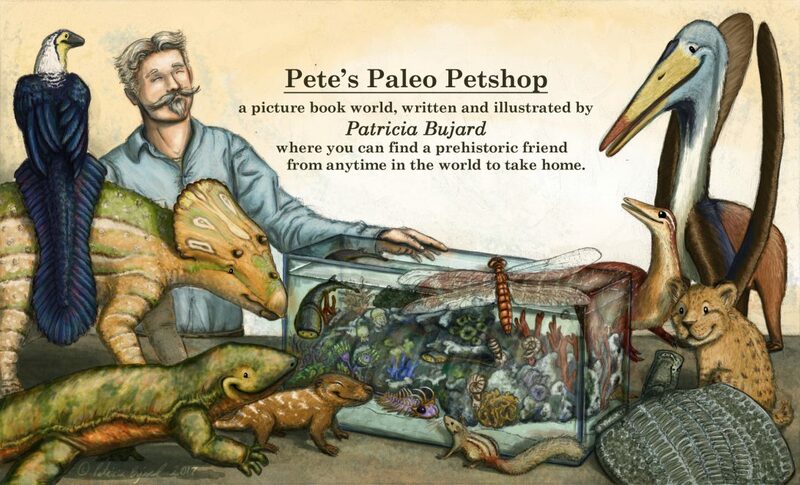 It’s an important part of the site, since it’s the first thing you see, and it’s the “front window” of Pete’s Paleo Petshop. But it’s also a test. A test for style, to make sure I’m happy with it, and it’ll have the feel I’m going for. And a test to make sure you like what you see as well. After all, this may be an ambitious idea and project, but the long-term goal is to earn a passive income in a way that doesn’t take time from my family. Which One is the Dinosaur? When it comes to prehistoric critters, it can be real easy to point at any large, scaly beast and call it a dinosaur. But there are a lot of prehistoric critters that were not dinosaurs, even during their heyday. In fact, dinosaurs are only a small fraction of the animals that walked around during the “Age of Reptiles”. Unfortunately, sometimes even “educational” books and movies will lump in the other critters in the same group as the dinosaurs. So how can you tell which is which? Let’s have some fun with a little quiz. Can you tell me which critters are the dinosaurs, and which ones aren’t? First off, a handy dandy dino checklist. Dinosaur hips make for straight, sturdy legs under their bodies, just like mammals. Unlike other reptiles that walk with legs splayed out, dinos tend to walk with one foot in front of the other, just like we do. Dinosaurs all lived in the Mesozoic period up to the present day. Birds, of course, can be seen outside your kitchen window. All other dinosaurs, or non-avian (not-bird) dinosaurs, appeared in the Triassic, reigned all through the Jurassic, and met their end at the Cretaceous. All Dinosaurs share the same latest common ancestor- the great-great-great-grandaddy of Iguanodon and Megalosaurus. Iguanodon is a giant, spike-thumbed plant-eater from Cretaceous England. Megalosaurus is a meat-eating distant cousin of T-rex, from Jurassic England. Sir Richard Owen coined the name Dinosauria based on Megalosaurus, Iguanodon, and Hylaeosaurus (a plant-eater built like an armored tank, but without the club-tail of more popular armored dinos. Cretaceous England). Dinosauria is often translated from the Greek as “Terrible Lizard”, but it can also translate to “Fearfully Great Reptile”. Owen seems to have named the creatures based on their awesome size and how majestic they must’ve looked in life. Not on their “terrible” teeth, spikes, and claws. Now that you know the features that make a dinosaur, let’s get started! 😀 I’ll leave the answers for the very end, so that you can test yourself. First up, Bowser the Ceratosaurus! He’s big, and lived in Jurassic North America. He has a nice beefy tail with the muscle power to move his legs forward, one foot in front of the other. Look who’s come out of hiding…Nessie the Plesiosaurus! Those flippers are great for gliding through shallow Jurassic seas or paddling in murky rivers. You’ll find her swimming around in Jurassic England. Here comes Bella the Camarasaurus! She’s a big girl, and proud of it, but she has no problem moving all that weight around. Her legs are like pillars, strong and sturdy under her body. You can find her in Jurassic North America. Why hello there, Dan the Dimetrodon is here for a special visit. He came by all the way from Permian North America, an earlier time than the Triassic period. Twig the Compsognathus is a little guy, only as big as a turkey, but that just means he’s extra fast. He runs like a roadrunner, and easily snatches up splay-legged lizards. You can find him in Jurassic Germany. Flipper the Ichthyosaurus comes in with a splash! But what is he? You can find him cruising Asian and European waters during the Triassic and Jurassic periods. Tango the Archaeopteryx loves to sing and dance, and no lizard can dance like Tango can! He’s got the finesse of a duck and the enthusiasm of a parakeet. You can find him and his fancy feathers in Jurassic Germany. Here comes Tigger the Pliosaurus with a big grin. An apex predator in the water, this big guy would’ve made the Jurassic seas around Europe and South America a dangerous place to be. Are those…Turkeys? Why yes, yes they are. They’re showing off their festive plumage by strutting with one foot in front of the other. You probably see one at your dinner table on occasion. Ron the Rhamphorynchus has dropped by to see you. Those teeth look a bit vicious, but he’s just an excitable fuzzball really. You can find him soaring through the Jurassic skies in Germany. Think you got them all? Let’s check and see! Bowser the Ceratosaurus is a dinosaur! He stands upright with his legs under his body, he’s a theropod (who were the theropod dinosaurs? ), and he lived during the Jurassic period- the middle of the Mesozoic era. Nessie the Plesiosaurus is not a dinosaur! She lived at the same time as many dinosaurs, and she’s big and scaly, so I can understand why she’s often thrown into the pile. She’s a marine reptile called a plesiosaur, and she’s actually the first discovered, so she got to name the whole group! Bella the Camarasaurus is a dinosaur! She stands tall and straight on legs like pillars, and she lived in about the same time and place as Bowser. Dan the Dimetrodon is not a dinosaur! Dan is quite a few million years too early, with the biggest mass extinction in Earth’s history between him and dinosaurs. But if you don’t know what time he’s from, then you can see that his legs are sticking out like a croc, instead of underneath his body. But he’s not a croc either. He’s a synapsid. Mostly that’s a fancy term about the skull. I’ll get to that when I’m working on the Permian period. 😀 That said, I totally get why people would think it’s a dinosaur. I mean, it’s everywhere! It’s even on my kids’ favorite oatmeal, y’know the one with the hatching dinosaur eggs? Flipper the Ichthyosaurus is not a dinosaur! He’s also not a fish, dolphin, or prehistoric whale. He’s a marine reptile called an Ichthyosaur, and he was the first of his kind discovered, so he got to be the namesake of his group. Since the name translates to “fish lizard” or “fish reptile”, then there’s no surprise when people call him one. The reason he looks like a dolphin is because the fishy/dolphin/shark body plan is so perfect. For an animal that is born, lives, and dies in water, then his body shape is perfect. Fun fact: Plesiosaurus was given that name because her kind is “nearer to dinosaurs” than Ichthyosaurs like Flipper. Tigger the Pliosaurus is not a dinosaur! It’s starting to look like there are no swimming dinosaurs. There are always exceptions to the rule of course *cough*Spinosaurus*cough*, but in general, you don’t really see dinosaurs getting specialized for a life in water. Tigger is another that gets to name his own group. The Pliosaurs. They were marine reptiles that thrived in the Jurassic and into the Cretaceous, but died out alongside the dinosaurs. A Turkey is a dinosaur! Yes, when you sit down for that turkey sandwich, or prepare for that Thanksgiving feast, you are about to eat a dinosaur. All birds are members of the theropod group (take a look at Bowser up there). Want more info? I’ve got a post on birds over here. Ron the Rhamphorynchus is not a dinosaur! Like the marine reptiles, his kind lived at the same time, and so are always being tossed onto the same pile. Ron is a Pterosaur, a flying reptile that is actually in the same family tree as crocs and dinosaurs, but not so close that he’s mixed in with the dinosaurs. Pterosaurs were usually pretty good at walking, but they didn’t have the same hip as dinos. I’m clipping along at a pretty good pace. Or at least a steady one (not really all that fast 😛 ). On Monday I officially posted my 50th post. I now have 19 amazing readers who also enjoy prehistoric critters. The website is looking more like a furnished house than an empty lot. The Critter Cards for six of the primary characters featured in the book are complete and ready as a set of free printables. Next step is completing a collection of mini-comics. Critter Cam: What You’re Dinosaur is Doing When You’re Not Looking. I’ll also be working on the next set of Critter Cards, and slowly updating some of the header images on the site. Like the Homepage picture and Meet the Critters. With that in mind, I’m working on the next step- finishing the first collection of mini-comics for an eBook. This eBook will be available for 99 cents, but you can purchase a physical copy for a few more bucks. Just a friendly reminder. If you’re seeing this in your email right now, it would be awesome if you’d click on the post title. That will take you to the actual page, which helps the Paleo Petshop get noticed by Google, which is a good thing if you like what you read and want to share it with others. 🙂 Thank you so much for being here with me. I truly appreciate it when we can chat a little together. If you don’t mind spoilers, here’s a preview for one of the comics- Dippy vs. Ball.